Shower sizes, types, cost. Shower dimensions standard. Actual dimensions will depend on a type and style of certain shower. Some compacts might have inside measurements 32” x 32” while another custom showers might be 72” in width and length or even bigger. Typical shower dimensions with prefabricated base. Shower stalls have not only base but ready to assemble and install prefabricated walls as well. Installation process typically very simple if follow all manufacturer instructions, but all plumbing work should be done accordingly to drain or (and) faucet positions which might be different for each unit. Shower stalls will vary in heights from 70 to 78 inches and will have base measurements similar to regular pan. Some stalls made according to standards of a tub and will fit perfectly in 5’ opening over bathtub. Custom on site build showers do not have any limitations and practically can be made any sizes or even shapes. Due to flexibility in design it is one of the most popular and practical options for any residential properties. Actual inside shower dimensions about 40” x 40” might be a satisfactory option for a single person. 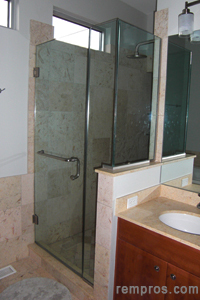 Incorporation of two shower faucets will require more room and 58 – 62 inches wide shower might work for couples. Shower bench which has to be at least one foot in width will consume interior shower space and the whole shower has to be reasonably big to accommodate any additional elements and still be comfortable inside. Stock prefabricated shower is one of the cheapest options. If the plumbing is ready shower stall with standard pan and shower door will be installed in one day. Labor cost and materials expenses to build a custom high end shower will be significantly higher. While shopping for a new shower, consider not only size but shape as well. In many cases neo – angle or rounded style of a shower, placed in the corner, might be much more preferable option comparing to traditional square or rectangle shape especially if the bathroom has a limited space.